Small, perfect and everywhere. Eights petals on this one. 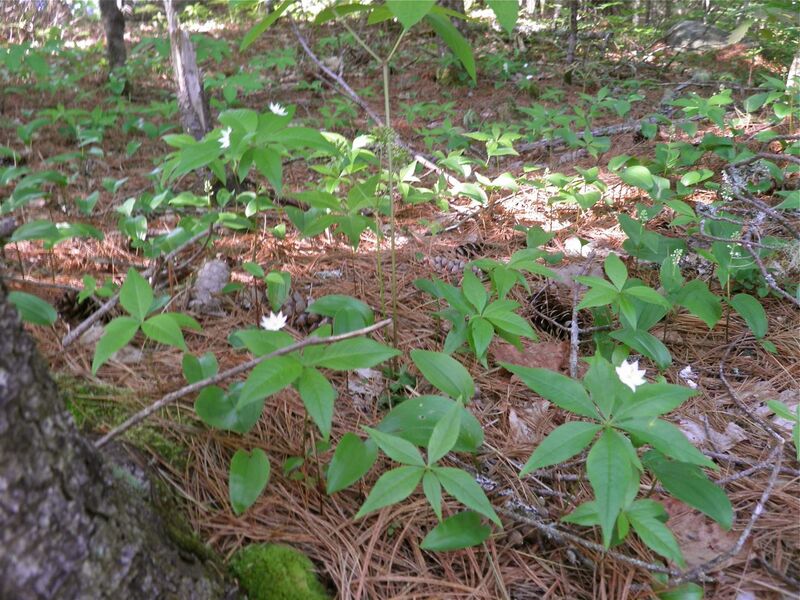 There’s some flowers that grow in our forests that can be called rare and with good reason. We have several species of orchids in Nova Scotia that fall into that category. Ram’s head Lady Slipper is one, as is several others. Not quite so uncommon is the pink lady slipper. Same flower, seven petals and two blossoms. There are others that can be called ubiquitous. They’re everywhere. So much so that we don’t even notice them. That’s a shame because each and every plant holds its own special beauty. 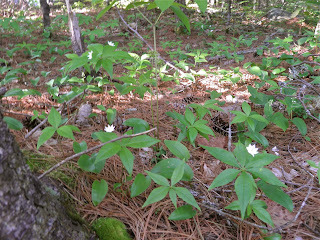 Many of those are the small forest floor flowers that are an important part of our ecosystems. 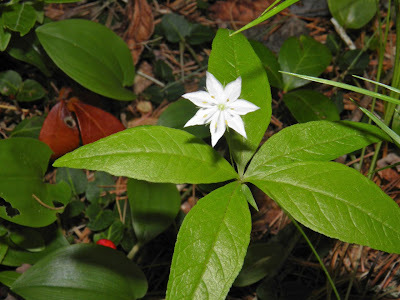 One such unnoticed flower is the diminutive Starflower. Starflower grows on the forest floor of boreal (northern) forests. It is a delicate, white flower perched atop a thin stalk. Partway up the stock is a “whorl” of leaves. I know you’ve seen it, but probably didn’t know its name. Starflowers are part of the Primulaceae (primrose) family. Other members are cyclamen, shooting star, lysimachia and, of course, the perennial favourite garden primroses. I remember this flower as part of my childhood. When you are a child all things hold a fascination and little is missed. These flowers stir memories of walking along the cabin road with childhood friends to swim at the local beach sunny afternoons. In fact they have been part of many of my childhood memories without my even knowing it. Walks with my Aunts Hilda and Nettie, bicycling to my Uncle Walter and Aunt Joyce’s cottage, and simple woodland exploring as kids will do. 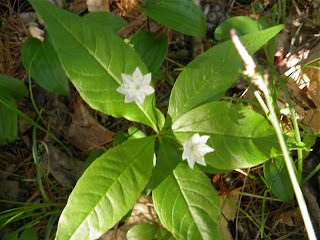 Starflowers bloom from May through August. They usually have seven petals, seven stamens and seven leaves. But that isn’t always the case. I have seen flowers with five, six or seven petals, and on occasion, two blossoms on one stalk. Even these pictures show variations. The flowers are followed by small berries with a few black seeds. Sadly, I cannot find any medicinal or culinary use for this small woodland dweller. I guess some things are just put on earth for us to enjoy. Starflowers prefer dappled shade and moist ground, but will grow in all but the most poor of soils. They form beautiful carpets under trees and make for cheery company on woodland walks. The latin name “trientalis” means “the third part.” It is believed by some that the name derives from the fact that the plant usually grows 1/3 of a foot (4 inches) high, but that has everything to do with where it is growing. It is apparent by just looking that the flower grows much more than that, depending on growing conditions. It’s always amazing to me the things that we see but don’t really notice. It’s the small things in life that give the most pleasure. 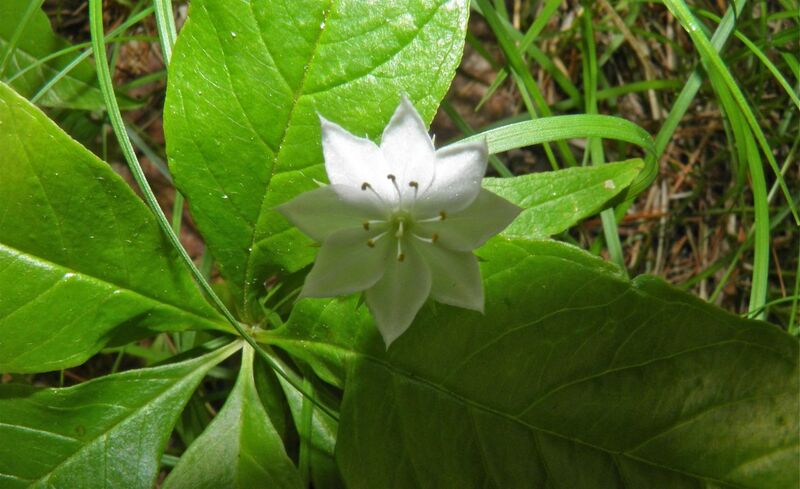 Starflower certainly ranks among those unnoticed gems.